52 Mantels: A Jolly Table and a Kid-Friendly Placemat! A Jolly Table and a Kid-Friendly Placemat! My chalkboard said 19 days until Christmas and I was like whaaat?? And, now? Now there are even LESS days until Christmas. Whaaaaat?? Time flies when you're covered in mod podge and glitter. Side note: Has anyone else swept glitter and/or pine needles off their hardwoods 13 times today? Oh Christmas, I do love how you sparkle. Where were we? Oh, yes. I was just about to tell you how excited I am to show you today's Creating Christmas project! And, you can go check out all my 2011 Christmas projects here, if you'd like. Yesterday I told you a bit about the Holly Jolly Jingle Hoppin' Cousins Christmas Party (whew...I'm tired just typing that) I threw for my daughter, nieces and nephew on Monday. 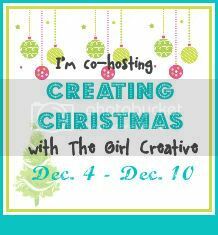 And, today I'm going to show you my party tablescape plus give you a tutorial for the festive kid-friendly placemats I made for the party! I love kid's parties because you simply can't overdo the jolly! Throw in some more color and sparkle, please. I picked up the Santa and snowman cups at Wal-mart for $0.97/each. Do you kind of want to drink your water from one? You can be honest. I started by using my silhouette to cut out the kiddos names and some simple Christmasy graphics. The front of my placemats were covered in a letter-sized laminating sheet and the backs were covered in white contact paper. To do this, I cut my contact paper into letter-sized rectangles. Then I took a piece of wrapping paper (I love Hobby Lobby's wrapping paper because it has a handy grid on the back!) and cut it a bit smaller than the contact paper. Then I arranged my names and graphics on the wrapping paper and attached with glue. I then covered the top with a laminating sheet and trimmed the edges. I think they looked great on our table and the kids got to take them home to enjoy all month! Don't forget to come back tomorrow and Saturday for more fun Christmas projects! And, don't forget to link up YOUR Christmas goodness on Saturday! I WANT a Santa Claus cup!!! I would love to come to this party! How festive and cute this is! And I ooohed and aaahed over your door chalkboard! How creative to hang it sideways like that! I'm your newest follower! Stop on by sometime. I have a weekly linky party called Terrific Under Ten Tuesdays. It's for projects made for $10 or less. I would love to have you! I want to come to that party! Love the placemats and the lettered centrepiece. Well done! PS I`m a new follower! The placemats are PERFECT! Love that you put such a personal touch into everything you do! And that sock wreath is just plain AWESOME! Love that you linked up to my party! I'm going to feature some things on FB and of course you'll be on the list little decorator/craft genius!!! الصراصير هى افة خطيرة تضرب منازلنا حيث ان الصراصير من اهم انواع الحشرات التى لها القدرة الهائلة على التكاثر والانتشار كما ان لها العديد من الانواع وتمتاز باختلاف احجامها واشكالها وتعتبر من اهم انواع الحشرات خطورة على الانسان حيث تعتبر ناقل جيد للعدوى للانسان ومسببة للكثير من الامراض ايضاً كما يمكن ان تتواكب الصراصير مع البيئة المحيطة لها .